Julie and I have been back in Barrancabermeja since early May. Normally, I'd have had a couple posts up by now, but the team was short on personnel, and I've had three back to back trips out to the campo. We'll be putting up several reflections in the next few days. Hope you have time to give them a look. Just briefly, to remind those of you who aren't up on why we are here, we have been serving with Christian Peacemaker Teams as part-time members for many years now, Julie since 1997 and Phil since 2009. Check out http://www.ecapcolombia.org/en/ to get an overview of the Colombia team's work. When I first began doing talks about my experiences, I would cite international human rights numbers for internally displaced refugees in Colombia at over 4 million persons. A couple years ago it bumped to over 5 million, and this spring reports have the number surpassing 6 million. This puts Colombia back in second place, behind Syria. Bet you didn't know that. 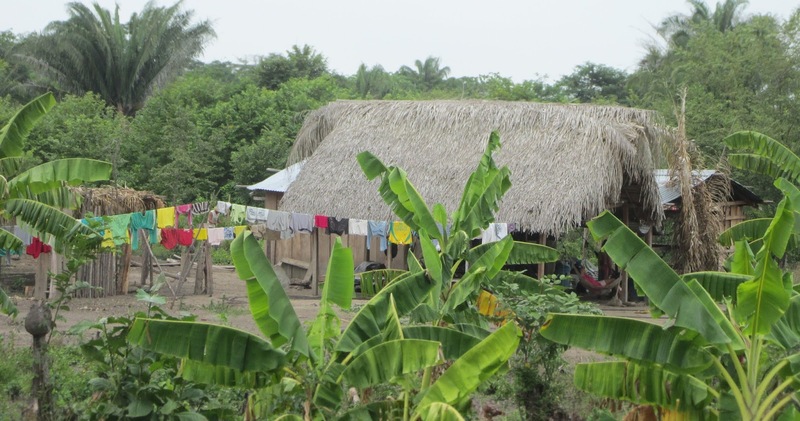 The Colombian government has been trying to address the issue, and made some serious legislative moves in 2011 to get these displaced families onto previously abandoned land where they could receive titles. Polarized congress members cite wildly disparate measures of success in their effort. In the middle lies the truth of the matter. Two of the communities that we have been accompanying, have completed all the necessary inspections and paperwork and have received national and international recognition for their efforts. But even these families continue to be physically threatened by large private interests, and the government, both local and national, appears incapable of addressing it. The lack of functioning legal infrastructure and abundance of corruption is jaw-dropping to outsiders and heart-wrenching for the victims. Then you have our own murky US national influence on Colombia. The following piece was inspired by news that was coming to a head during our first week here. I’ve claimed to be an organic gardener since I originally started planting vegetables in SE Ohio in the early 1970s. At the same time, I confess to having used Roundup and a few other herbicides to deal with poison ivy and a few other invasive species that were frustrating me. I apply it as sparingly and specifically as possible, never when windy or wet. 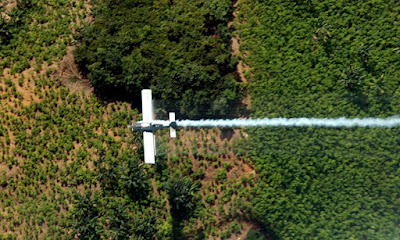 So, last week, here in Colombia when we were sitting in a restaurant watching the mid-day news on the TV I was stunned to see video of US planes flown by US contractors aerial spraying US-supplied glyphosate on suspected coca (plant used to make cocaine). Glyphosate is the active ingredient in Roundup. Everything I knew about applying this chemical said aerial spraying had to be a bad idea. The practice is making the news because in March the World Health Organization’s research arm issued it’s finding that Glyphosate is likely carcinogenic. 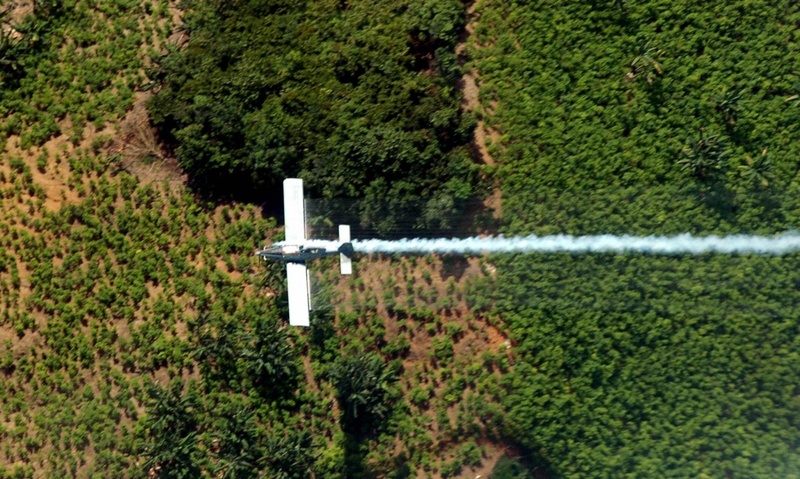 Then on May 9 President Santos called for a ban on all aerial coca fumigation. It has been a controversial program with opponents likening it to Agent Orange use during the Viet Nam War. Residents in the areas of spraying report the loss of food crops, and various illnesses have been linked to the practice. The cancer link has moved Colombia’s Health Ministry to support the ban. Proponents of this kind of aerial spraying are few. The US, one of the last countries to support aerial fumigation, says that in the long run the benefits outweigh the risks. They point to the decline in coca production since 2008. They also point to GPS units now installed in the planes that allow complaints from farmers to be promptly investigated. To this I say, campesino lives matter, too. I cannot imagine the public outcry if the federal government were to begin aerial spraying of Roundup in rural communities to control marijuana planting in the US. How can we continue to treat citizens of other countries as if their lives do not have the same value as American lives? Thanks for this, Phil. It's important for us, in the USA, to know what our government is doing there in Colombia and what people face there. Before leaving you had less than positive feelings about the progress you had seen the past visit. It was great news when I read: "I came away from Buenos Aires feeling more optimistic than I have ever felt about this particular community. 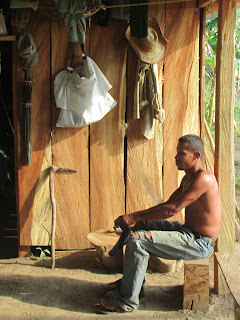 But just as in my last blog focused on Guayabo, it is not over, and it is not simple." We know that your presence and those of your organization is part of the solution.